We’ve all got at least one person on our list that’s nearly impossible to shop for — they already have everything and they want nothing! And that makes it hard for well-meaning gift givers. That’s when you have to look for something personal, something thoughtful or something they didn’t even know existed. From homemade tasty treats to unique DIY keepsakes or personalized home decor, you’re sure to find something on this list of gifts for people who have everything. Your gift will be cherished by even the hardest-to-shop-for person on your list. Rock and mineral buffs will get a kick out of washing their hands with these gorgeous gemstone soap rocks. They’re almost too pretty to use! Blankets and throws are always gift-worthy. This one puts the fun in functionality with bright and colorful knots that look cute while keeping you cozy. A plant-loving pal on your list will appreciate this modern, sophisticated way to display their favorite photographs. A border of greenery adds a touch of class to their cherished memories. For the person who loves plants and has a taste for mid-century modern style, check out this ultra cool set of hanging planters, perfect for air plants or trailing succulents. Looking for a fun, fabulous gift for a sophisticated lady on your list? We’re head-over-heels for these bold and saucy six-inch stiletto planters. Customize your own bottle opener with inspirational quotes, fun photos or words of wisdom. Package it along with a six-pack of their favorite brew and you’ve got a clever gift idea. Cheers! Here’s a simple way to spruce up the bar cart, wet bar or drink display. Decanter tags are a beautiful, classic way to organize the liquor. Choose letters that correspond to the type of liquor, “T” for Tequila, “W” for Whiskey or “R” if you’re a rum drinker. Bacon makes everything better — even these candles made from soy wax, beeswax and, you guessed it, real bacon grease. Now you can have the undeniably delicious aroma of meat candy filling the air, even when you’re not hungry. No two trees are exactly alike, so this tree stump table is truly the only one of its kind. Warm, rustic and also modern, it would be a welcome addition to any home. It’s traditional to give bread and salt as a housewarming or wedding gift in Germany, to ward off evil spirits and bring prosperity and fertility to the recipient. Add a personalized cutting board and kitchen towel and you’ve got a complete creative gift. Concert aficionados and music buffs will cherish a shadow box filled with all their musical mementos, like concert tickets, backstage passes, wristbands and guitar picks. Home fragrance diffusers make great gifts, and you don’t have to be a scientist to make them yourself. You can easily create a custom scent for everyone on your list. Give the gift of comfort. This cute pillow, customized with their name, favorite quote or inspirational message, is a terrific tribute to your friendship. Family portraits make thoughtful, traditional gifts. Create a unique spin on a classic by cross-stitching your family portrait and finish it with a personalized picture frame. Spice up their life with this space-saving vertical herb garden. Perfect gift for the foodie or budding chef on your list. Do you need something for all the people on your naughty list? These DIY lump of coal soap ornaments are a hilarious last-minute handmade gift. And they make great stocking stuffers! If you’re shopping for a beach lover, don’t miss these personalized canvas totes. They make perfect beach bags that work equally well off the sand, too. Light up their life! Boring white pillar candles are transformed into gorgeous and whimsical centerpieces with vintage images. They can be personalized to match any decor. A big, soft and squishy, chunky knit floor pouf is the perfect cute and casual accessory for someone who likes to hang around or cozy up. Prop up your feet and relax. Calendars are a fairly common gift, but they only have a shelf life of one year — unless you have this perpetual calendar. Bright colors make it a practical work of art; a gift that keeps giving year after year. A reusable tote is a great gift for anyone on your list who is environmentally conscious because it replaces plastic shopping bags. Personalize this eco-friendly gift with custom text or your favorite photo. These too-cute clay candle holders are a fun — and non-prickly — way to get in on the cactus trend. Add colorful candlesticks for a bright and cheery display. The artwork on old vintage sewing patterns is so cool, why not put them to good use and decoupage a box with your stack of unused patterns? It makes a unique gift for anyone, especially those who love to sew. These eclectic layered necklaces are popular among fashion bloggers and it’s easy to see why. The trendy charms and mixed metals go with practically any outfit. Customize the look with charms that are meaningful and it’ll be a treasured gift. This sweet little mirrored wall shelf is a new take on a classic. Simple, practical, yet beautifully simplistic, it would be a perfect gift for someone who appreciates modern design. If you’ve got a friend who loves all things 80’s — the music, geometric shapes and neon colors — they’re sure to love this totally awesome 80’s-inspired quilt. Radical! This crocheted basket, with a stylish chevron pattern and easy-to-grab handles, is big, soft and durable. It’s perfect for the person who has everything to store just about anything. Do you need a great gift for the “hostess with the mostest” or a last-minute present for a foodie friend? These wooden serving boards deliver in every way. For a creative gift hack, wrap your serving boards with a decorative tea towel. This mulled cider liquid soap smells amazing — bringing all the warmth and comfort of fall in a decorative bottle. It’s also all natural, and wonderful for those with sensitive skin. Here’s something for the coffee aficionado on your list that’s more creative than another old mug. Makes a great gift or a really cute decoration for your coffee bar. The tea fanatic on your list will love sipping from one of these customized mugs. 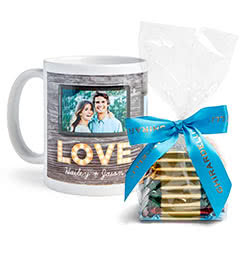 Add your favorite photos and a personal message for a totally tea-riffic thoughtful gift. These cool customized paperweights put the fun in functional. They’re a unique small gift for a coworker, a boss, a teacher or writer. If you thought Jenga was a fun game, you’ll have even bigger fun with giant Jenga! It’s a fun twist on an old classic — the perfect gift to bring to a gathering with family and friends. You may be surprised to learn just how easy it is to weave a basket using paper. Now you can take your stacks of old newspapers out of the recycle bin and create colorful, useful newspaper baskets for your friends and family. These small-scale hanging planters are perfect for a plant lover with modern taste. They add a little bit of greenery and a lot of style to a small space. 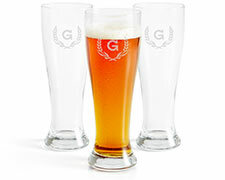 Do you have a craft beer lover on your gift list? Now they can chill out on the patio with a cold one while keeping the bugs at bay — using tiki torches made from their favorite beer bottles. Plants make people happy. These handmade ceramic airplant vessels include an easy-to-care-for airplant and are an attractive gift for friends that love plants — even if they don’t have a green thumb. The person who has everything probably also has a dog. And, one can never have too many photos of their furriest best friend. Make a pawsome personalized dog photo book they’ll cherish fur-ever. Handmade, sweet-scented lavender bags are a perfect way to keep clothes smelling fresh. Toss them in your closet or in a drawer to keep stale odors away. Tie a few of them together with a pretty ribbon and they make a thoughtful gift. Do you have someone on your shopping list who has a quirky vintage style? An upcycled suitcase has a new life as a funky little side table. Here’s a unique gift for someone who loves wine or your friend with a green thumb. Made from used wine bottles, these innovative planters are both decorative and functional. A custom collage is a perfect creative present for someone who’s short on space. Personalize it with photos and all the memories you’ll share for a lifetime. This pretty tray is an easy-to-make handmade gift. Press flowers from a wedding or use leaves and flowers that bring back special memories and it’ll become a cherished keepsake. Transform a space and create a one-of-a-kind vibe with printable wall art. Then, check out these unique ways to display your art. From traditional frames to clipboards and paper clips, you’re sure to create a display that’s uniquely yours. These fashion-forward leather plant holders gift a sophisticated look to an everyday potted plant. Fill it with your favorite flower or bush to make a surprising and sweet gift for anyone on your list. These hanging planters offer a really cool mid-century simplicity. They’re a versatile and elegant way to upgrade any space and make a swoon-worthy gift for a plant lover on your list. They may look good enough to eat, but these popsicles are actually made of soap! Cute, bright and colorful soap popsicles are a fun and unique gift. Just make sure no one tries to eat them! Know someone who loves to relax outdoors? Then you can never go wrong with an oh-so-cozy hanging hammock chair. Oversized paper flowers are as pretty as the real thing — and don’t need any watering! Made from a variety of colors that will match any decor, these romantic, whimsical giant flowers are sure to bring a smile to anyone’s face. Looking for a gift that’s useful, beautiful and a little bit glamorous? Look no further than these stunning agate coasters with gold gilded edges. Get ready for cool evenings by the fire! This propane fire pit is not only sleek and stylish, it totally folds up and is portable, too. A vintage tin combined with a lamp kit and a frilly shade is an adorable one-of-a-kind addition to a room. This is a fabulous gift for a friend who loves antiques. Here’s a way to motivate the person who has everything to start saving up for the next big thing. Include some starting cash in the jar if you’re feeling extra generous. Traditional shaving soaps are making a comeback for good reason. This all-natural soap is not only environmentally friendly, but it delivers a closer shave than modern shaving cream. It would make a hip, trendy and thoughtful gift. Here’s a purr-fect present for the cat lover on your list. DIY a planter in the likeness of their furriest friend and plant catnip or wheatgrass inside. A bucket and two rugs have been upcycled into this storage ottoman. Versatile and stylish, cute and functional and a charming gift for the person who has everything. Fortune cookies are a sure way to brighten anyone’s day — but compliment cookies are even better! These tasty cookies are dyed fun colors and then stuffed with custom compliments to make anyone smile. Agate is undeniably beautiful, but did you know it’s also said to have some healing properties? This mobile made with cascading slices of agate and gold wire is a simple, elegant way to display the popular stones. Nothing says “you’re special to me” more than a batch of freshly baked cookies. Attach a colorful cookie gift tag and sweeten someone’s day. Fashion meets aromatherapy with these beaded bracelets. They’re a functional yet fabulous way to take your favorite essential oil blends everywhere you go. Looking for the perfect gift for your favorite artist or crafter? Look no further than these pencil cups decorated with the pages of a coloring book. They’re a striking and artsy way to keep organized. Birthdays, holidays, weddings or just because… there are endless reasons to send someone a card. Now you can make send own stunning handmade cards made with alcohol ink. For those with a green thumb or a love of indoor plants, this planter adds a touch of elegance to any room. Plus, it’s on wheels to make cleaning the floor a breeze. Gifts from the heart, personalized presents or tokens that express your love are always accepted with a smile — even from the person who has everything. From small gifts to large, when it comes to gift-giving, a little bit of creativity goes a long way.